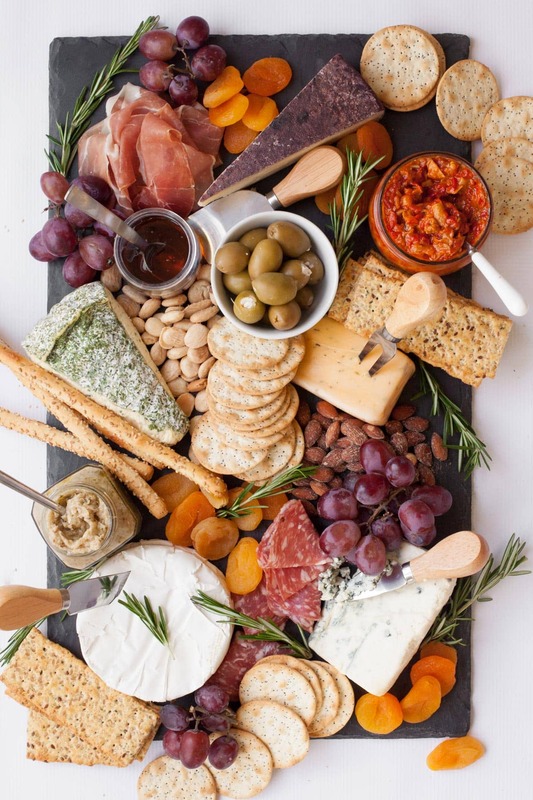 ﻿Cheese boards are my JAM for holiday entertaining. They are delicious. They are impressive. And they are crazy easy to put together. I’m a big fan of dishes that have a high oooh-and-ahhh to elbow grease ratio. And cheese boards are the epitome of a great return on investment. They take just a few minutes to put together, and man, do they ever look sharp. So much so, that when you bring one out, more often than not, one of your guests will say, “Oh, you didn’t have to go to that much hassle for me!” To which you will then laugh and tell them it took you like three seconds to put together. Or you’ll let them continue to feel guilty. Depending on how much you like your houseguest. 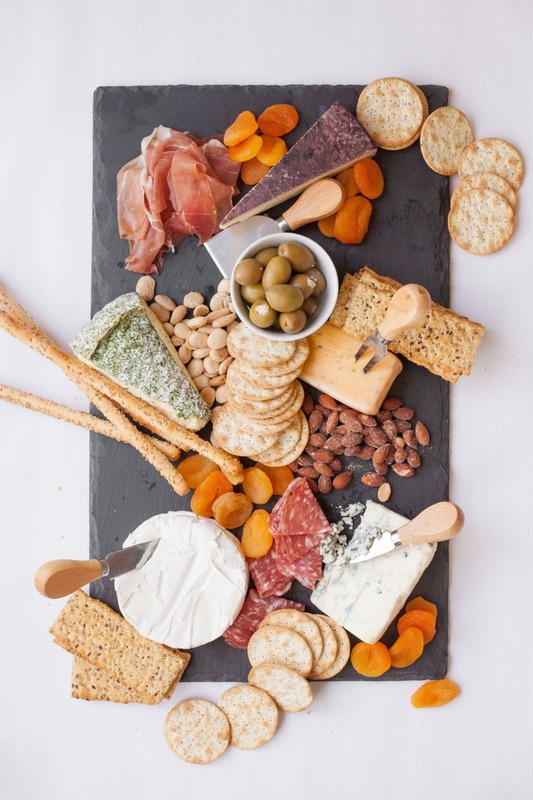 Now, there are a lot of cheese board tutorials out there. So let me tell you why mine is different—it isn’t ridiculous. 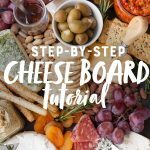 Some of the cheese boards you see that are making the rounds on Instagram have hundreds of dollars worth of ingredients put into them, tons of food styling time, and so many moving parts, it seems almost impossible to wrap your brain around. That isn’t my cheese board. I’m so not that kind of girl. My basic principle when making a cheese board is to put piles of stuff I like on a board. Done. It really is that simple. 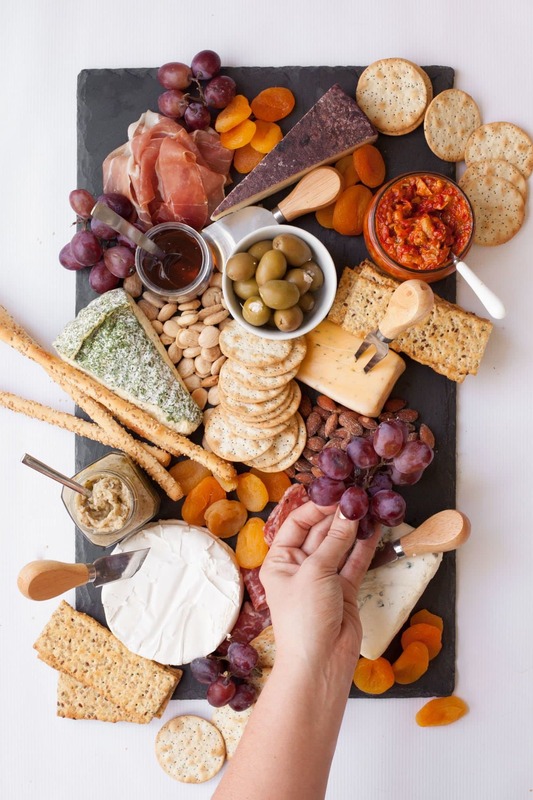 If you want a little more rigidity, try to make sure you have items in each of a few categories—cheese (duh), salty, sweet, cracker-y, and condiment/sauce-y. I’ll talk a little bit more about each of those categories in a sec, but when you’re gathering ingredients at the store, it’s good to think of filling up those flavor “buckets”. Or don’t. Seriously, don’t overthink it if you don’t want to. I promise you can’t mess this up. In fact, the messier, less organized, more rustic a cheese board is, the more beautiful I think it is. I don’t pre-slice my cheese, mostly because I’m lazy (I use these really affordable cheese knives instead). I don’t make perfectly organized rows—I’m a big fan of the pile method. Seriously, friends. Just put stuff you like on a board and serve it. Let me show you exactly how I make my cheese boards. I have a large slate board that I nabbed from Crate and Barrel that I love. I think the black background really makes everything look beautiful—it also allows you to write on it in chalk (if I ever left extra space on my cheese boards to do so). Don’t have a speciality cheese board? Ain’t no thang. 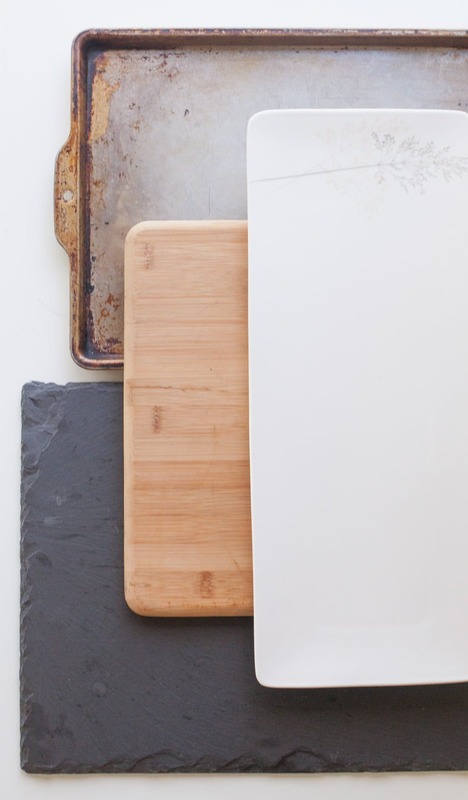 Use a big cutting board (I have this bamboo one that is perfect), a serving platter, or even a cookie sheet works—it looks all rustic and cute-like. Head to the biggest supermarket in your area and hit up their cheese counter. Grab a mix of textures (soft, hard, and crumbly), strengths (not everyone loves stinky cheese like I do), and colors and shapes (for visual interest). Most of those cheese counters will let you sample cheeses if you don’t know what you’re buying. And many also have a bargain bin where you can get small wedges or wheels for just a few bucks—this is great for cheese boarding! Like I mentioned above, I don’t normally pre-slice my cheese before it goes on the board – instead, I use cheese knives). There are two reasons for this. First up, I think it just looks better. Perfectly aligned rows of pre-sliced cheese remind of deli cheese trays. There is something really organic and beautiful about seeing the whole wedge or wheel. Secondly, it’s so much easier! Let your guests do the work. 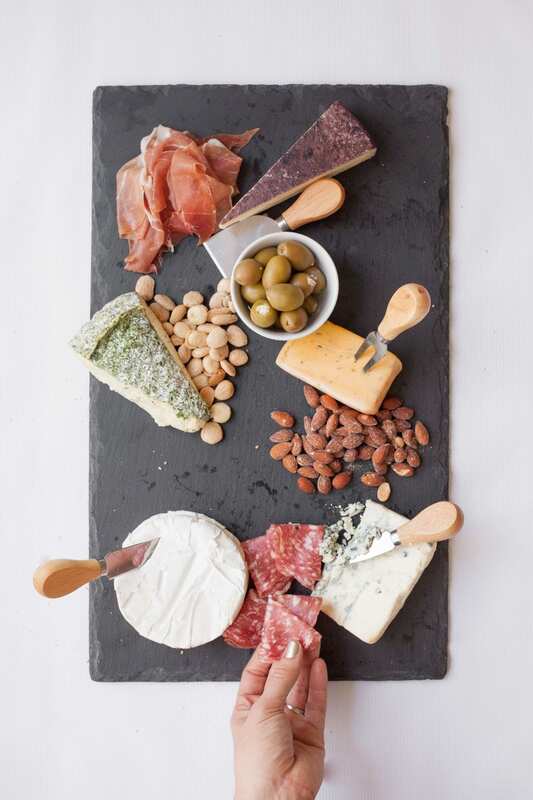 Part of the fun of eating a cheese board is getting to nibble on lots of different flavors and textures. If you’re not vegetarian (or if your guests who are vegetarian aren’t strict vegetarians), add some charcuterie like prosciutto, salami, or sausage. I also almost always add stuffed olives (in a separate bowl). Olives are polarizing, but if someone loves them, they are really happy to see them. And if they don’t? Well, the olives are quarantined to a bowl and won’t infect the rest of the cheese board. I also like to add some roasted and flavored nuts, too! It’s nice to just be able to grab a few to crunch. Dried and fresh fruit are the way to go to satisfy the sweet factor here. I really love dried apricots because they have such beautiful color. Any fruit you like or have on hand would work. Just make sure to treat fruits that oxidize (like pears and apples) with a fruit preserver before putting them out (I like this one). No one wants to eat brown apples! I like to use a mix of crackers, just because it’s fun, but use whatever makes you happy. I just pile them on the cheese board wherever there are openings. You can always restock if you run low on crackers. I also like to include some crunchy breadsticks. They look pretty and they’re fun to snack on! 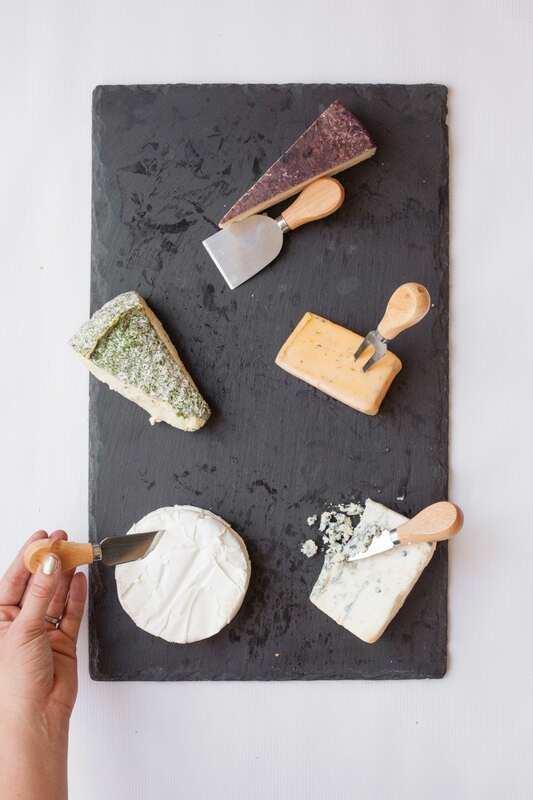 You could stop working on your cheese board right here, and it’d be delicious, beautiful, and everyone would love it. For overachiever status, continue on. Condiments are a really fun addition to a cheese board. Some of my favorite options: honey, fancy mustards, jams, and preserves. You can add sauces and chutneys and whatever else makes you happy. This is a really great excuse to use all those little gift jars of jams and mustards and such that people have gifted you (or is that just me? am I the only person that gets 400 tiny jars of jam a year?). If the bottle the condiment comes in is small enough, I just take off the lid, stick a spoon in it, and call it day. If I need to transfer it (like with honey), I move it into a small jar or bowl to save space. 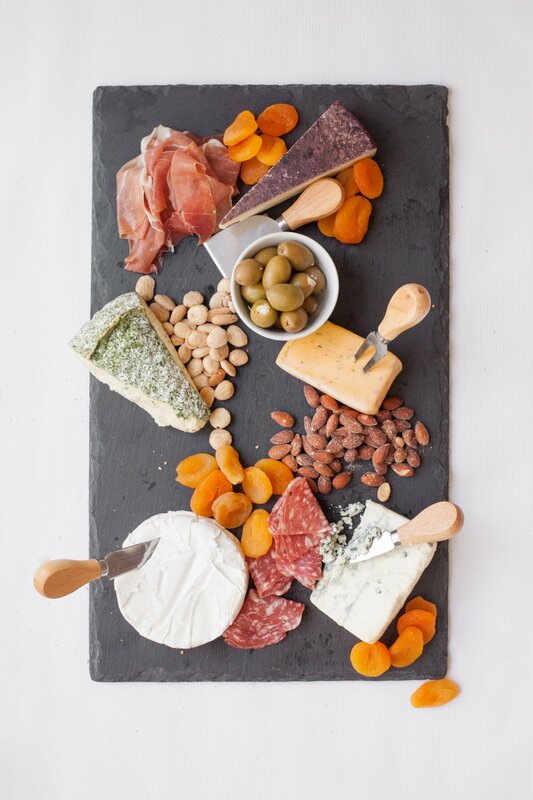 This is what will help make your cheese board look really amazing—fill in all the empty spaces. I like to do this with little clusters of grapes. They fill in all the nooks and crannies nicely, and they’re the perfect size for someone to grab and just eat a few grapes. Another good option: cherry tomatoes. Both grapes and tomatoes help add some really beautiful color! Finally, garnish that baby. For the holiday season, I love just adding a few sprigs of fresh rosemary—it looks a lot like a Christmas tree, and it smells amazing. I also tend to use fresh sage a lot, too. Is this step important? Heck, no. Does it look good? Absolutely! And it takes about 10 seconds to do. And that’s it! I know that was a lot of explaining, but honestly, the whole process takes less that five minutes. And look at this beauty! 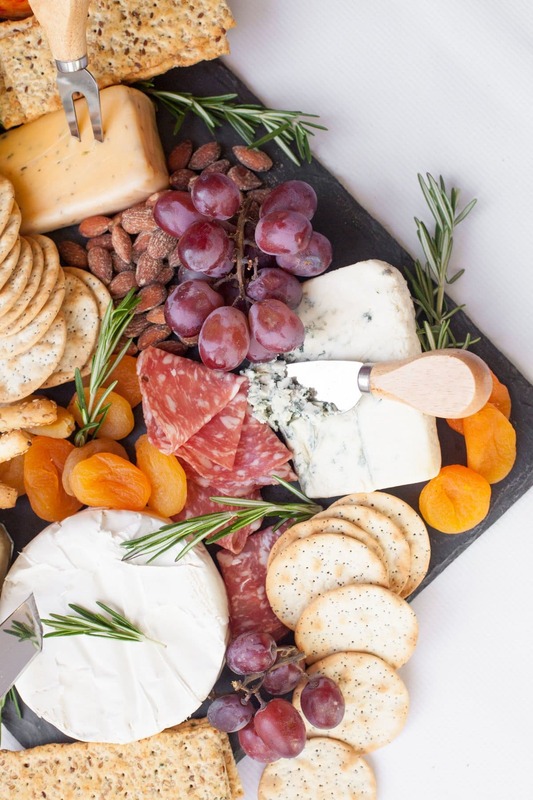 Now, of course, I’ve been talking a lot about using a cheese board for serving to guests at the holidays, but it’s also important to note that a cheese board dinner is a favorite in our house! We have it every few weeks. It’s a super speedy dinner (perfect for weeknights). It’s fun for everyone (even my toddler loves it). And it’s relatively healthy (especially if you go heavy on the fruits and veggies). Happy cheese boarding! I think I started on this same post but ate it before I got pictures done. This is how I do it too! So easy, so delicious, and the best party/people food around! I have bought some crazy gorgeous boards from Turkey on Etsy. If you are willing to wait for it to get shipped across the ocean on a boat, it’s fairly cheap way to get really pretty boards. I’m obsessed, I’ve bought three this year from overseas! This is so great keep it up! Thank you! I have always wanted to make/create a cheese board and gave up before shopping because I hadn’t a clue where to begin. Breaking it down into these steps makes the effort worth it! Now, to add it to my holiday menu…. I am a big fan of everything that goes on a cheese board. I’m in a book club and our food spread is pretty much based on cheese, salty meats and crackers so I really enjoyed this post and your tips! Great tutorial – love the pictures! This is so cool. I am planning to do a cheese plate for this thanksgiving. this is a great share. I made a very similar cheese board for my husband’s birthday this year. I kept asking what he wanted me to make for his birthday dessert, but he never really came up with anything, as he isn’t a big sweets guy. But he loves cheese and salty things. When I showed him the awesomeness, he was super impressed and thought I had spent hours on it. So easy and delicious! It was a big hit! And I’m with you on the simplicity factor – simple = goooooood! Yummmm and perfect timing – I’ve got a group of friends coming over for a make-your-own-gnocchi night and this will really push it over the top! 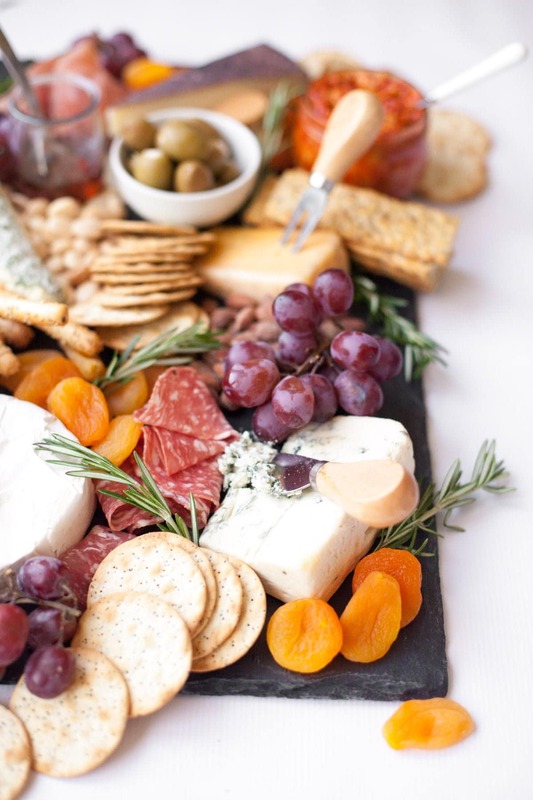 This is great Cassie….just what I’ve been wanting to do but didn’t know where to start….I will be making a cheese board for Thanksgiving appetizer spread this year! I don’t even like cheese but I read this post with an intensity like I was going to get quizzed on it. You made it all make so much sense! And your pictures lately have been so gorgeous–especially the last shot of this post!! This looks amazing! Your board is so full and lush looking! I want to dive right in! Thanks so much for sharing this! I have never thought of making a cheese board like this before. I eat a lot of cheese and when we are visiting France (living in Europe) eating cheese is of course a classic. But presenting it like this is a wonderful idea and new to me.. Thanks for sharing! I love cheeseboards! This one is beautiful, great pictures! I’m roaming through old post and have decided to serve this at a potluck on Thursday. Great idea. 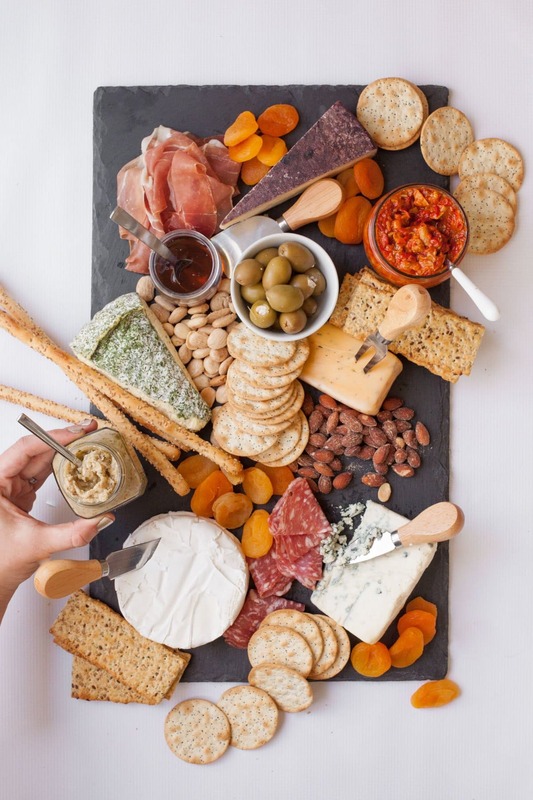 I made a BEAUTIFUL cheese board all thanks to this helpful article. Thank you so much! Your cheeseboard idea was a hit!!! Artistic and beautiful was the words spoken. God bless you for this!!! Love… love …. love this idea! Looks beautiful! Can’t wait to try it… everyone will be so impressed! I’m trying this out tomorrow at a casual brunch hosted by my sister-in-law. Yours is so gorgeous, I just couldn’t resist it! I’ll let you know how it goes :) Thanks so much for sharing! Loved your post… will use my grandmother’s bread board from the early 1900’s as the base and vintage Carnival glass for spreads this Thanksgiving. My way to honor someone I never had the opportunity to meet. Thanks for the inspiration!! THIS. IS. AWESOME. THANK YOU!!! 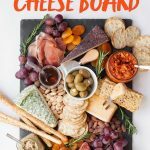 I always thought this looked like such a fun idea when you originally posted it, and when I got assigned appetizers for our Christmas/New Years celebration I knew I wanted to make a cheese board! Yum! Great post!! Super awesome recipe. I just loved it. I will definitely try this as soon as possible. Thanks for making and sharing such a great post with all of us. Keep sharing. I appreciate your work. What cheeses did you use here? I read this post and then cruised by the cheese section at Whole Foods and was overwhelmed. I don’t know much about cheese so soft, hard, mild, strong, etc….I’m still like huh?! Sorry for being cheese-ignorant. Cassie, this is SUCH a great post! 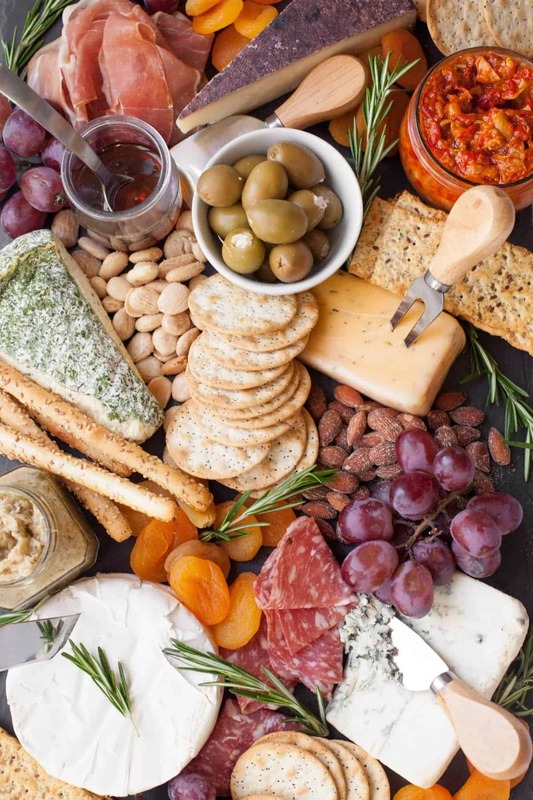 I’m going to send readers to your site for these great instructions in my every-day-of-the-week email celebration; this time for June 4, National Cheese Day! Yay! Nice work. Now I’m hungry.